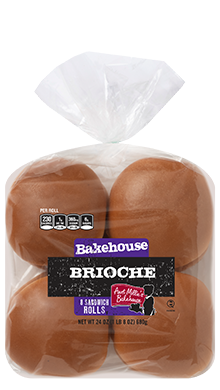 When you want a great tasting, conversation starter bun for your next meal, these Brioche Sandwich rolls are it. 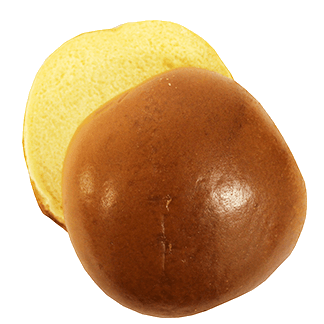 With it's unique texture, it's hard to resist. 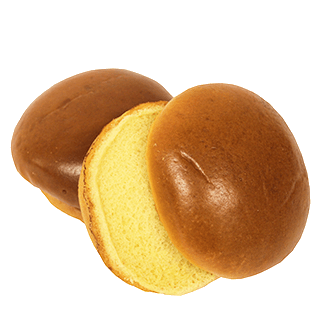 ENRICHED FLOUR [UNBLEACHED WHEAT FLOUR, MALTED BARLEY FLOUR, REDUCED IRON, THIAMINE MONONITRATE (VITAMIN B1), RIBOFLAVIN (VITAMIN B2), NIACIN (VITAMIN B3), FOLIC ACID], WATER, HIGH FRUCTOSE CORN SYRUP, YEAST, OIL BLEND (SOYBEAN, PALM FRUIT, CANOLA OILS), SALT, WHEAT GLUTEN, WHEAT PROTEIN ISOLATE, NATURAL AND ARTIFICIAL FLAVORS, MONOGLYCERIDES, YELLOW CORN FLOUR, SPICE OILS (TURMERIC AND ANNATTO), CALCIUM PROPIONATE (A PRESERVATIVE), DEXTROSE, LACTIC ACID, VINEGAR, SODIUM STEAROYL LACTYLATE, VEGETABLE PROTEINS (PEA, RICE, & POTATO), CALCIUM SULFATE, CITRIC ACID, ASCORBIC ACID, VITAMIN A PALMITATE AND BETA CAROTENE (FOR COLORING).